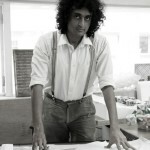 Arjun Rathi is the principal of the self-named multidisciplinary design practice operating from Mumbai, India. 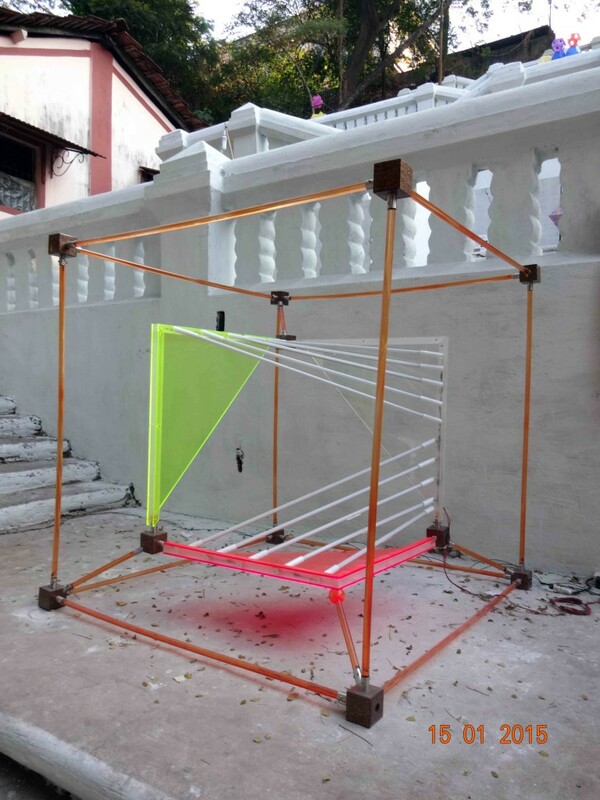 Established in 2011, the work has gained national recognition for its exploratory approach towards design processes. 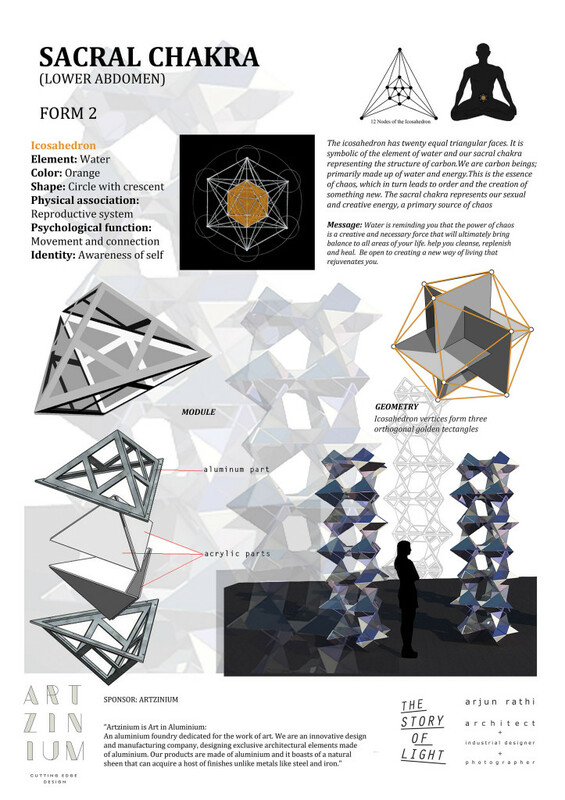 Through the disciplines of Architecture, Landscape, Interior Design, and evolved concepts of ‘Psyche-tectural’ theory, the practice aims to create innovative spatial forms that actively engage, enhance and influence the body, constantly challenging its relationship to the built environment. 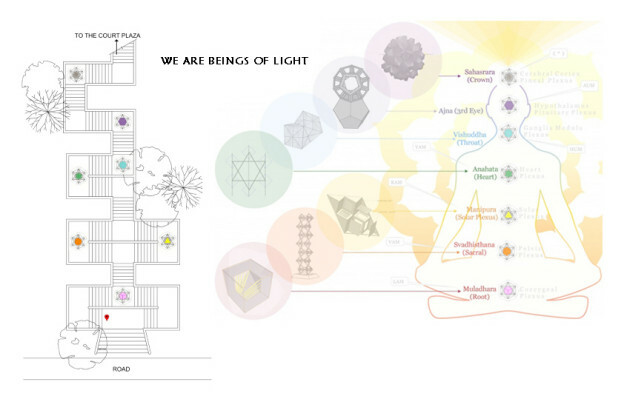 ‘We are Beings of Light’ is a fine example. The light emitted from each individual being forms the “aura” and is directly related to the body’s 7 and 13 chakra system. Each chakra or energy point has a sacred geometry form associated with it. 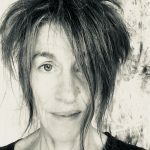 There are 7 Common Basic Shapes which often show up in people’s Auras – these are the Platonic Solids – and each has its own meaning which you can learn. 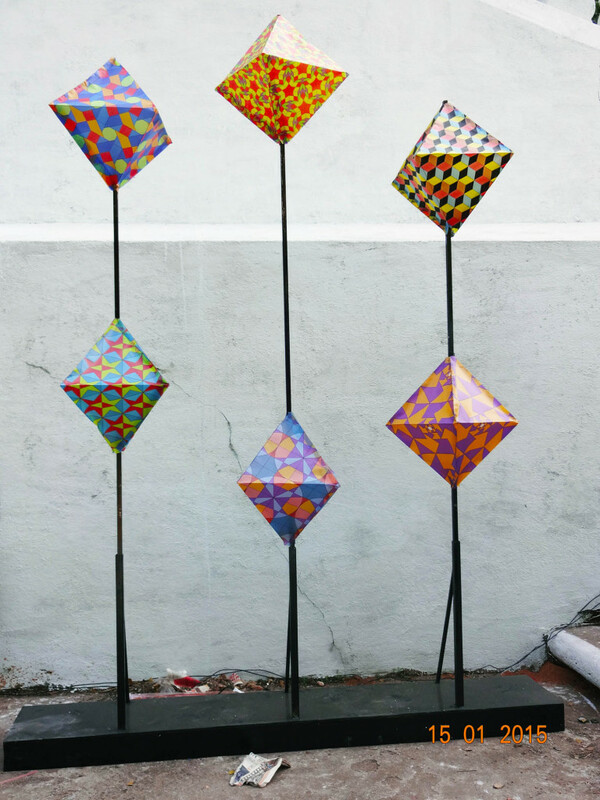 Cube, Sphere, Icosahedron, Dodecahedron, Octahedron, Tetrahedron, Pyramid. There are the 7 ‘Chakra Colours’ – Red, Orange, Yellow, Green/Pink, Blue, Purple, White – which, when associated with a Sacred Shape, specify more detail about exactly what is going on in your aura or in another person’s, bringing helpful insights to your life. 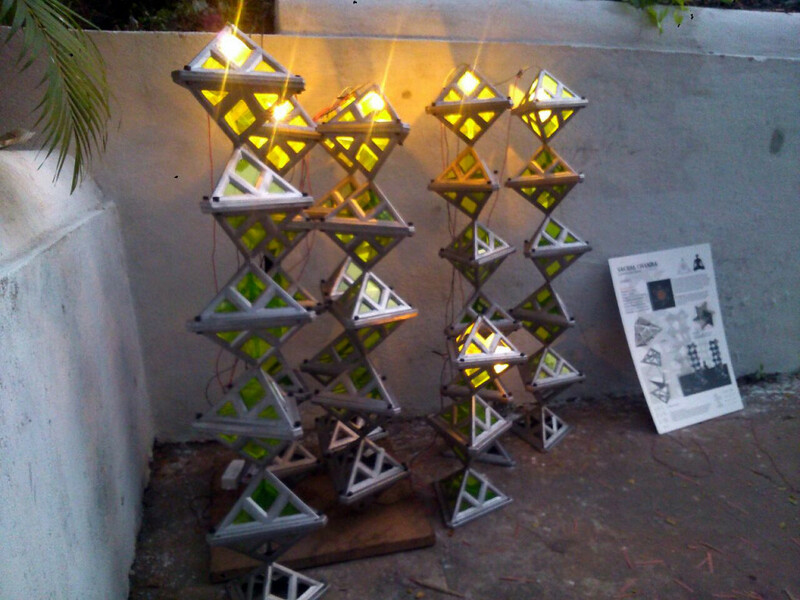 The project explored this concept of “light beings” and the “chakras” that compose them. 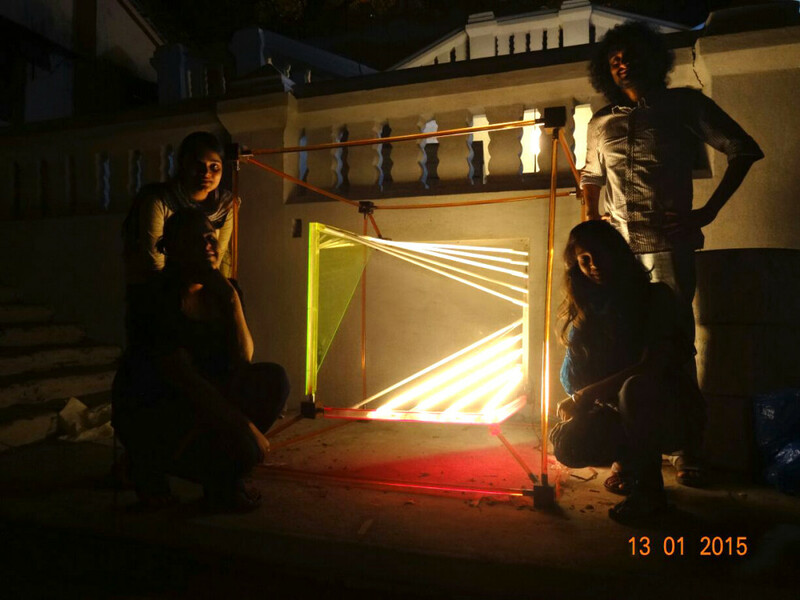 The installation work with intersections of geometrical forms associated with each chakra to create installations of light. 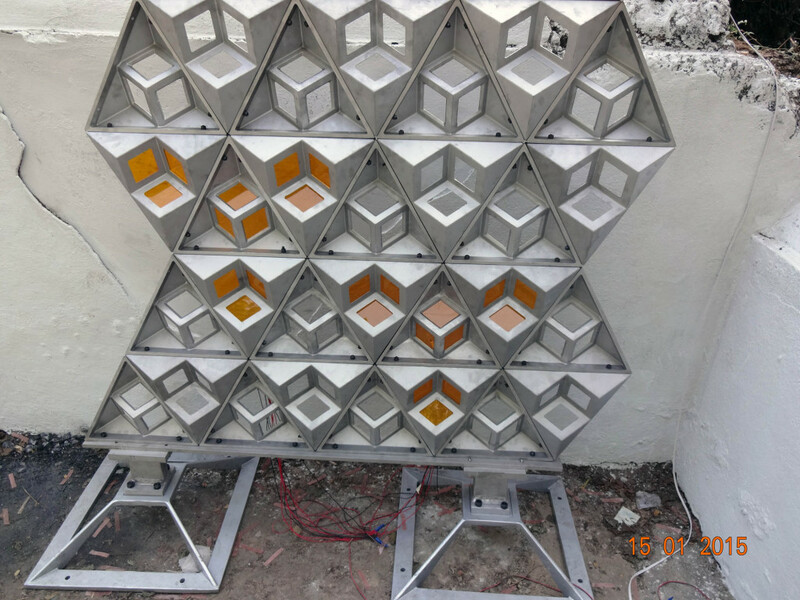 All forms had elements of the golden ratio and its associated proportions and were experiments with different materials to create products or art represent each form. 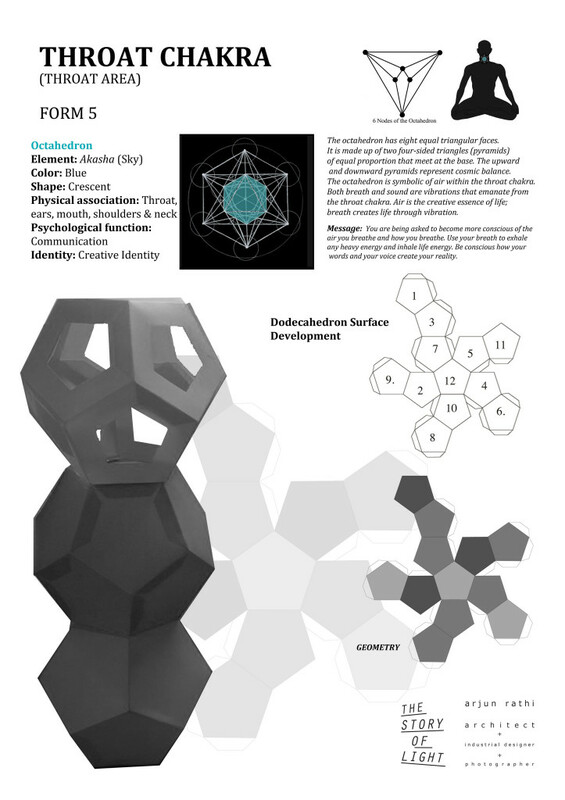 The interchangeability of the platonic solids gave flexibility to the forms generated. 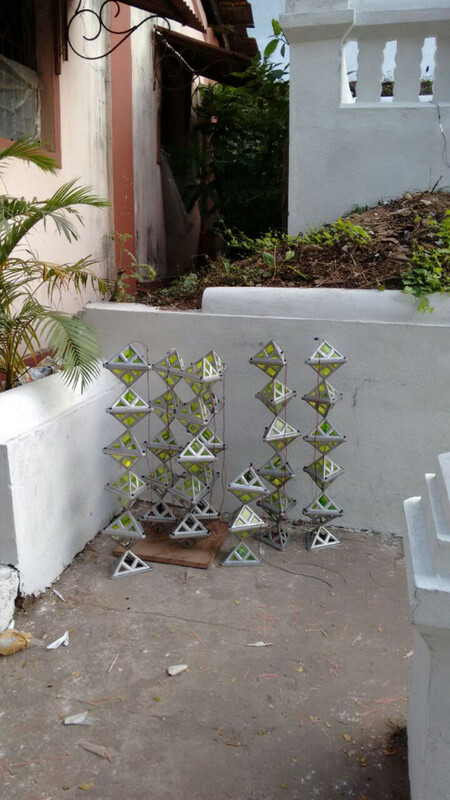 The site for display was the cascading staircase that lead to the Panjm High Court. The stepped stairs were located 50 meters away the city centre marked by the Panjim Church. Generally a high traffic area throughout the day and evening the road was an axis between one of Panjim’s cultutal districts Fountainhas and Market areas around it. 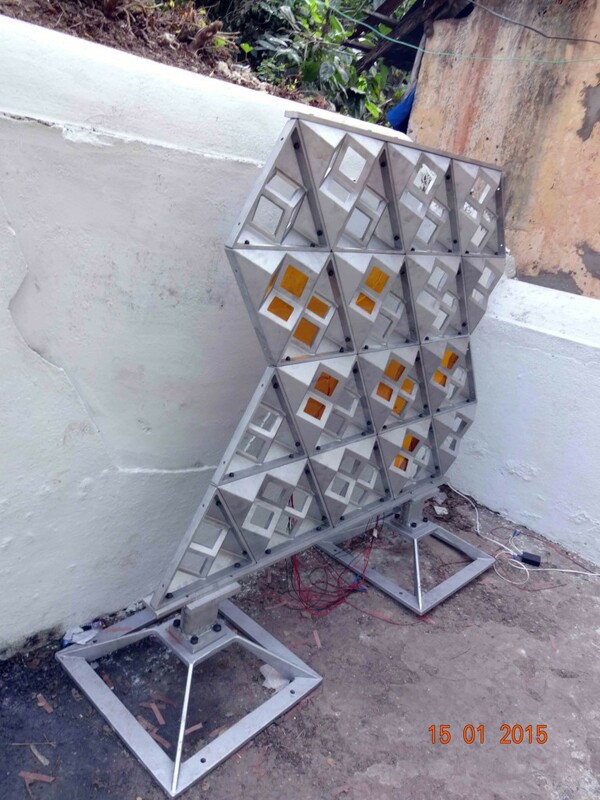 The installations were placed on the mid-landings of the stepped street; each form partially revealing itself from the street level; thus engaging visitors to enter the site and discover the forms as they walked up the stairs. 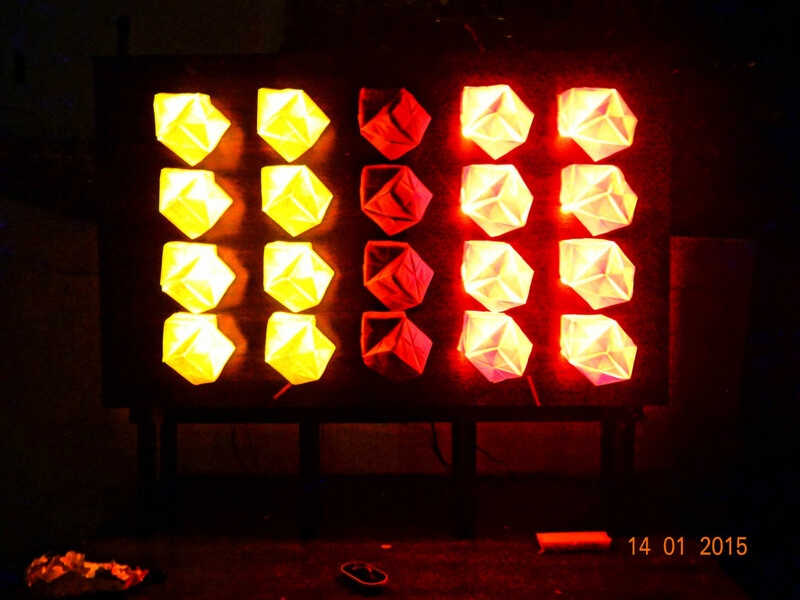 Through micro-controller and analog programed functions the installations created an engaging light display. The root chakra is located at the base of the spine and represented by the Hexahedron or Cube shape. 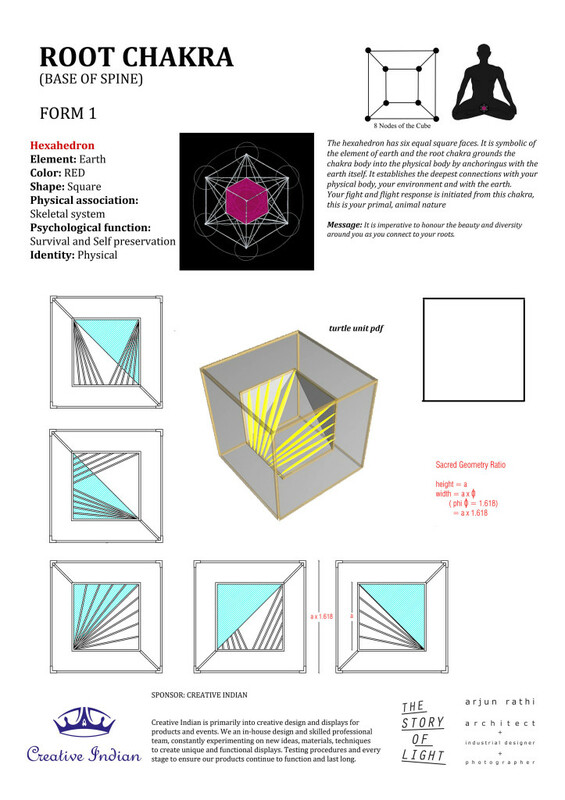 The concept of the Hexahedron was presented as a 3-dimensional model of a Hypercube or Tesseract (A Cube form in a 4-dimensional world). 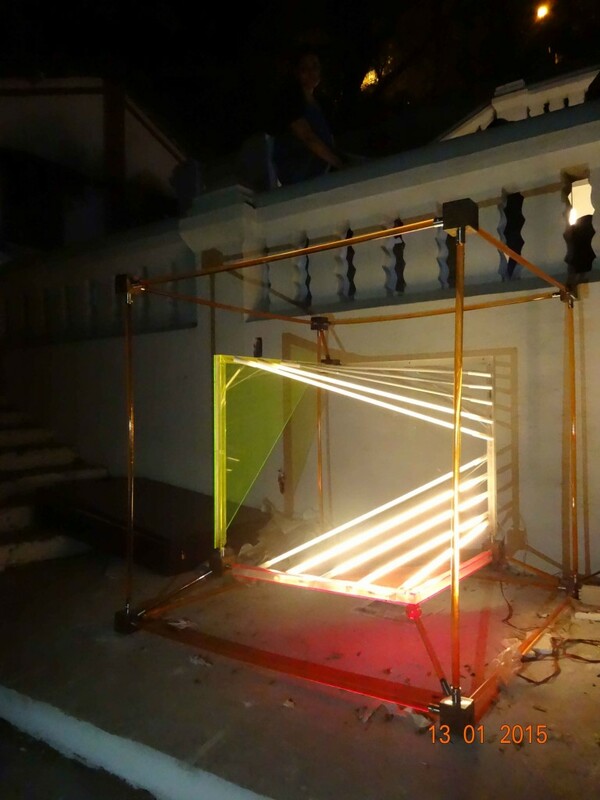 The installation frame and elements were made using acrylic rods and sheets; with the inner cube composed of 12mm DIA LED tubelights programmed to look as is the cube is rotating. 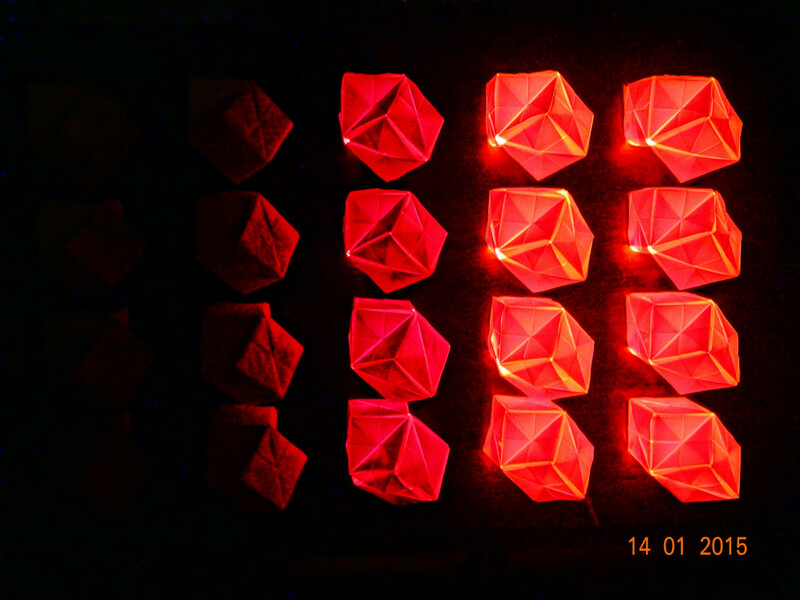 The sacral chakra is located in the lower abdomen and represented by the Icosahedron (a Polyhedron with 20 faces). 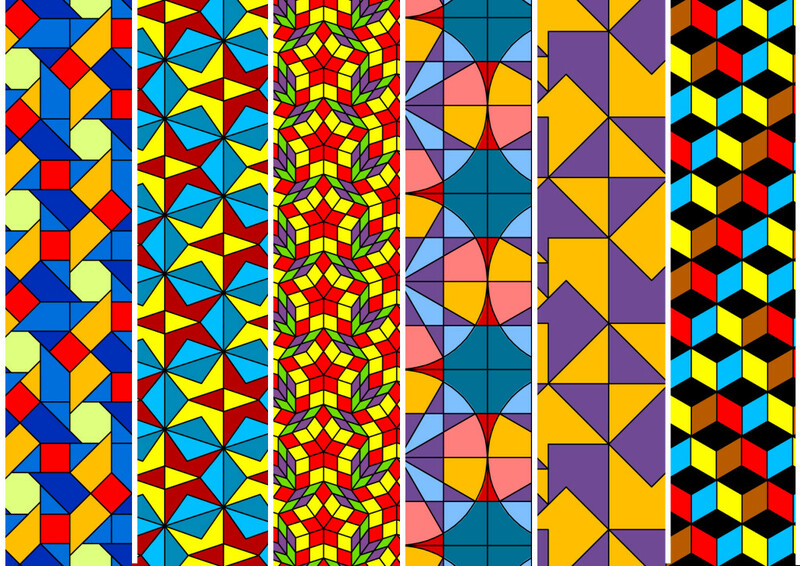 There are many kinds of icosahedra, with some being more symmetrical than others. 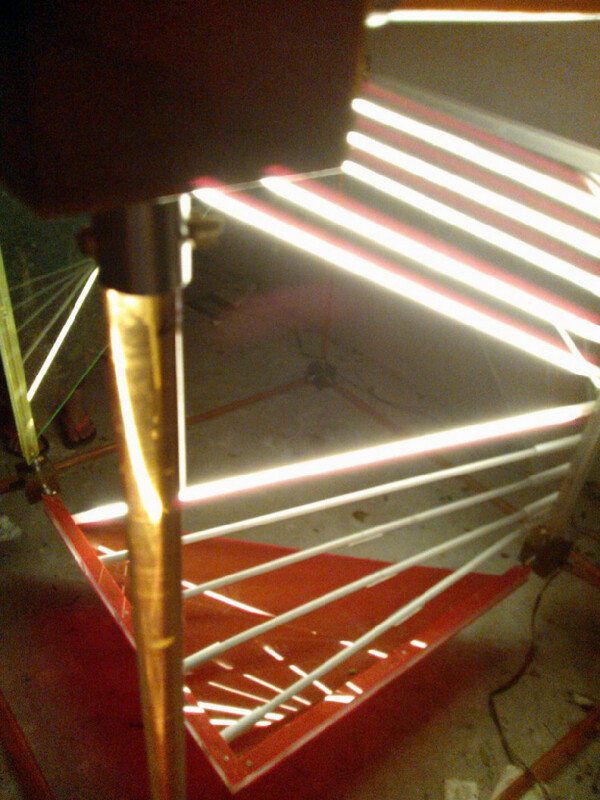 The installation was exploring a vertical column structural system made using aluminium cast forms. The solar plexus chakra is located in the stomach and represented by the Tetrahedron. 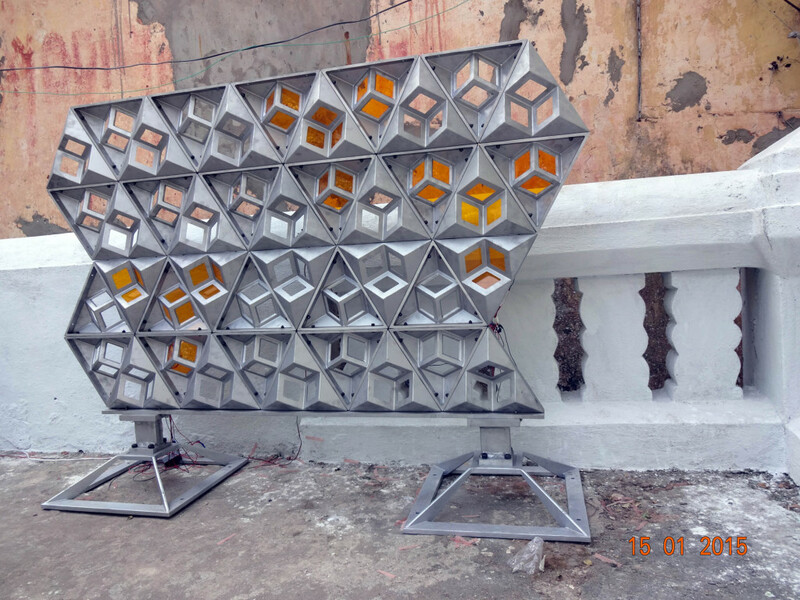 The modular form created using casted aluminium modules was a prototype for a media façade or free standing screens inspired by the tetrahedron form. 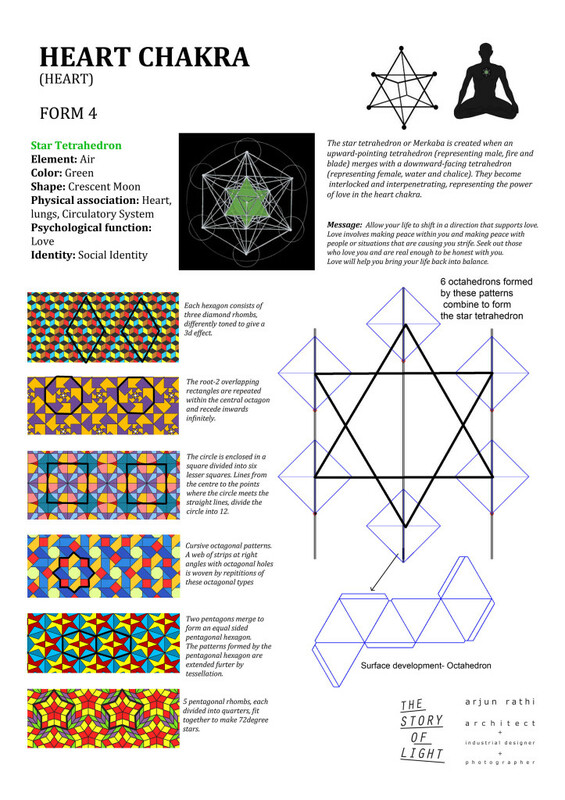 As the name suggests the fourth chakra is located in the heart and is represented by the Star Tetrahedron Shape. 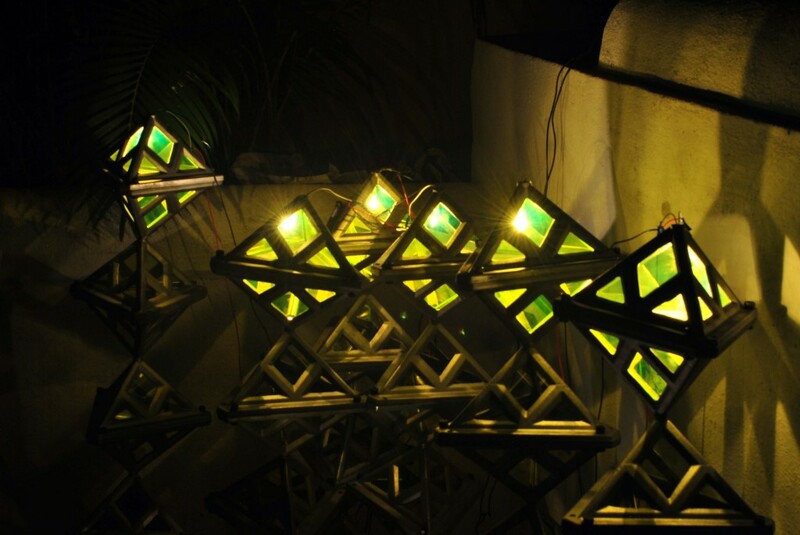 The installation was exploring sacred geometry patterns and diagrams representing the star tetrahedron. 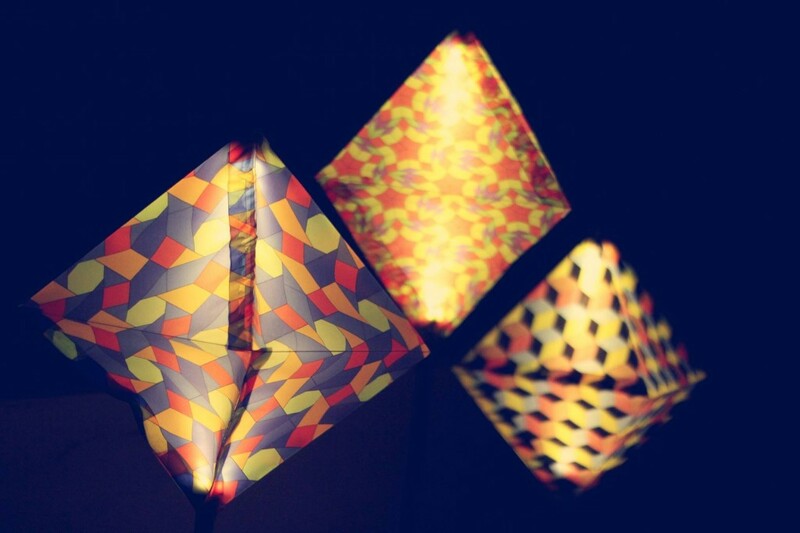 The diagrams were 2D projections of sacred structures, which were printed on translucent paper to create lanterns. 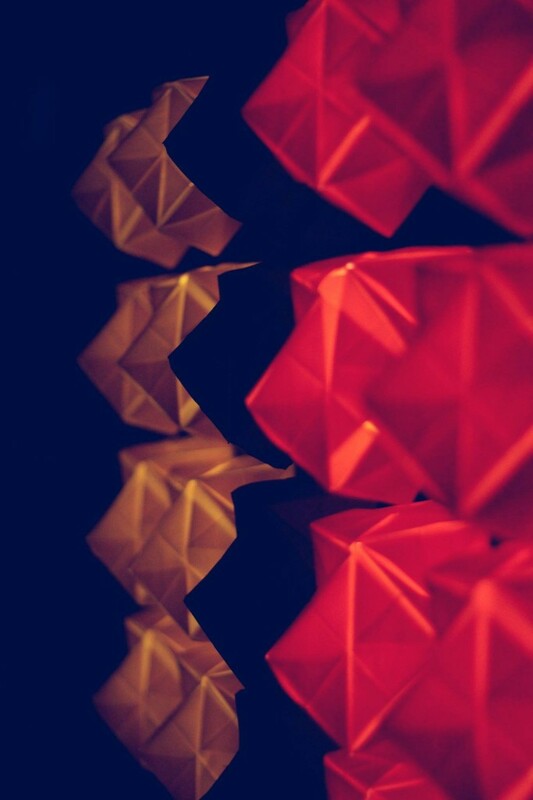 The fifth chakra is located in the throat and is presented by the Octahedron. 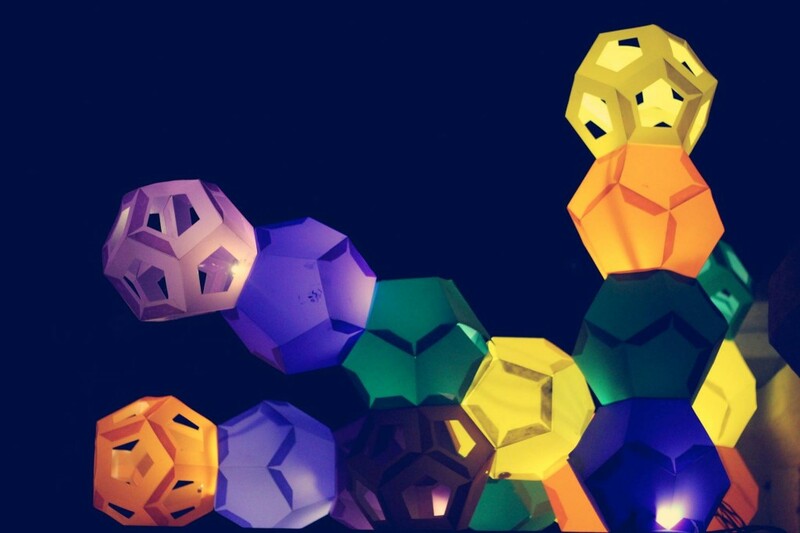 The octahedron shape perfectly fits into the Dodecahedron platonic solid, which was used to create the installation. 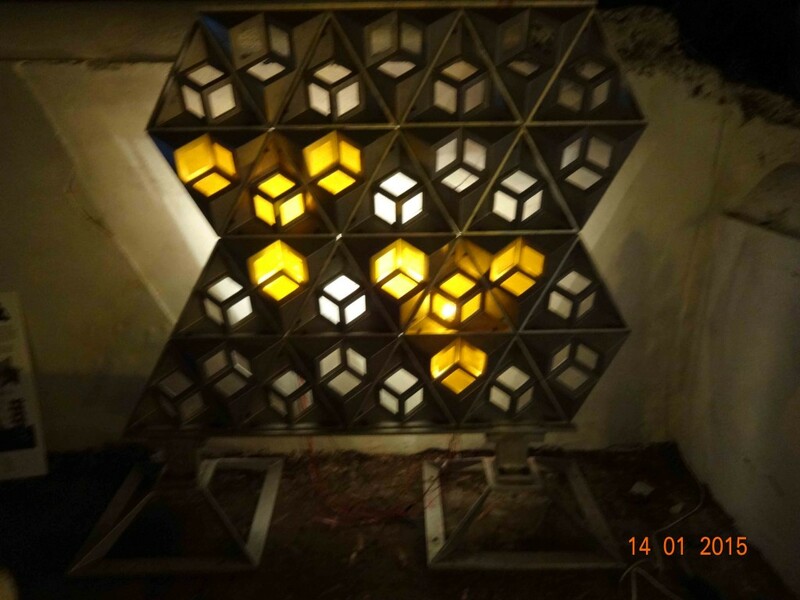 The shapres were made using PU plastic sheets and lit internally using micro halogen bulbs. The sixth chakra is located in the middle of the forehead and is represented by the Dodecahedron. 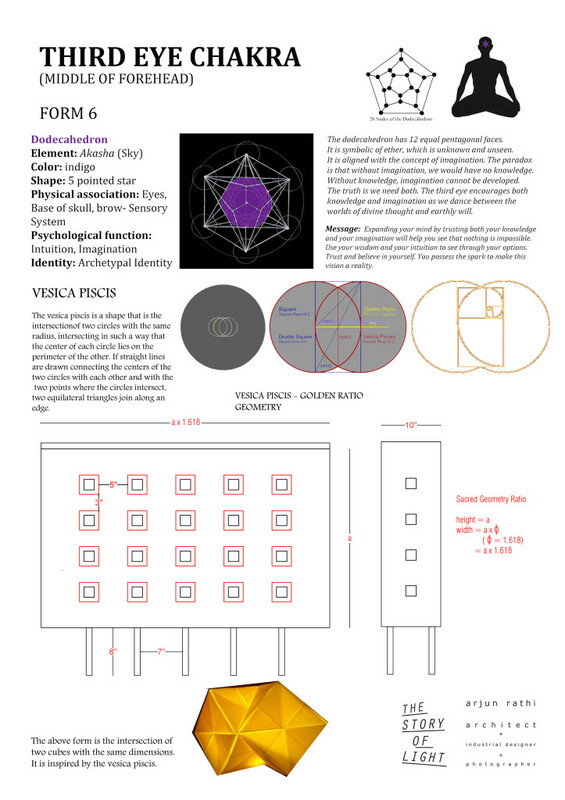 In Sacred Geometry, the Vesica Piscis diagram is used to represent the Third Eye Chakra. 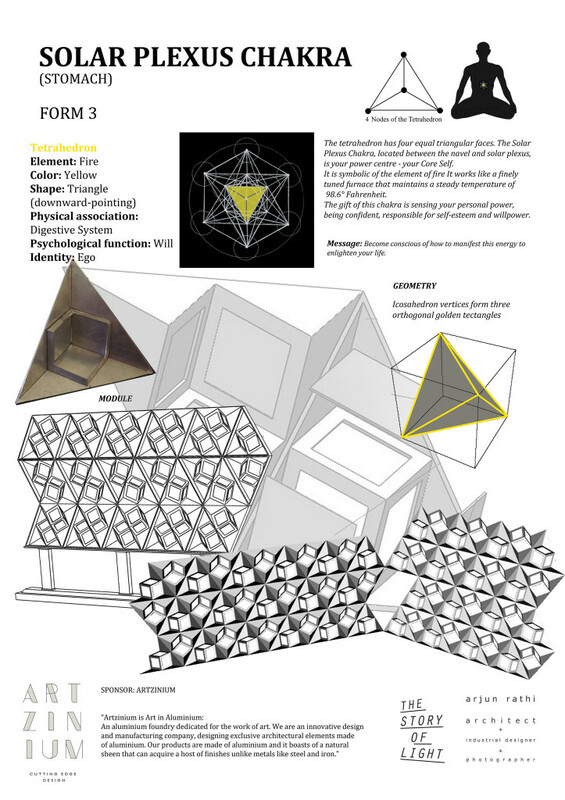 A 3D representation of the diagram was derived using platonic solids to represent the form. 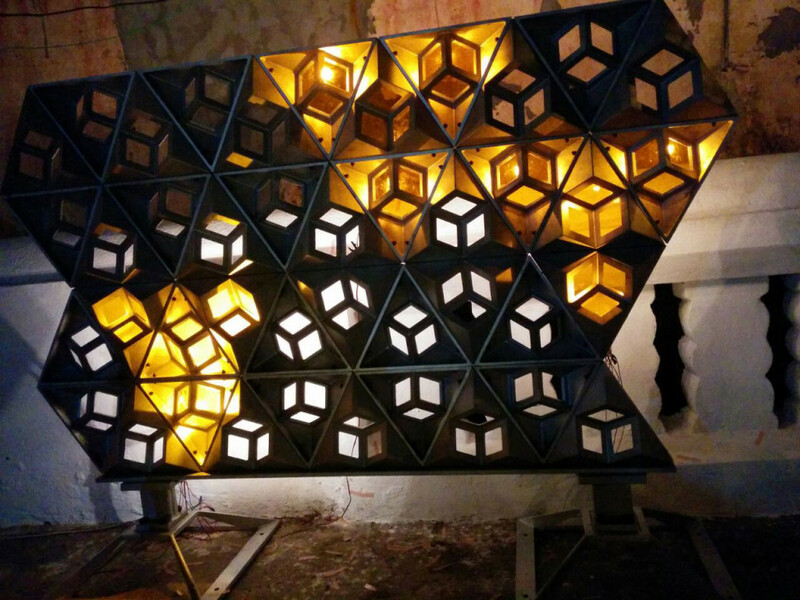 The intersecting cubes were aligned in the form a building with automated programing to represent the intersection of two cubes. The seventh chakra is located at top of the head and is represented by the Sphere. 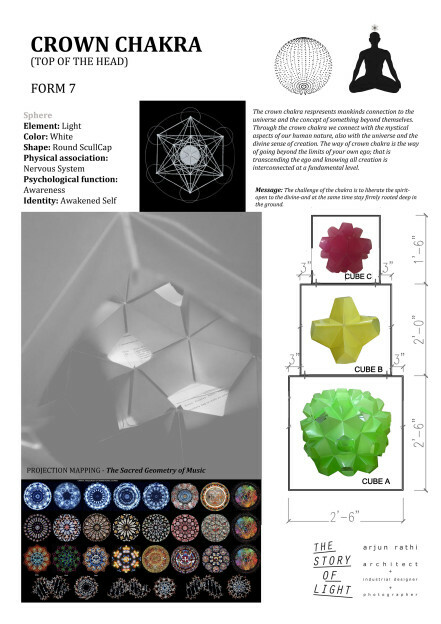 The chakra is responsible for creating the energy ‘sphere’ around the body; hence derivations of the spherical shapes, inspired from the origami “Turtle” unit, were created and projection mapped. 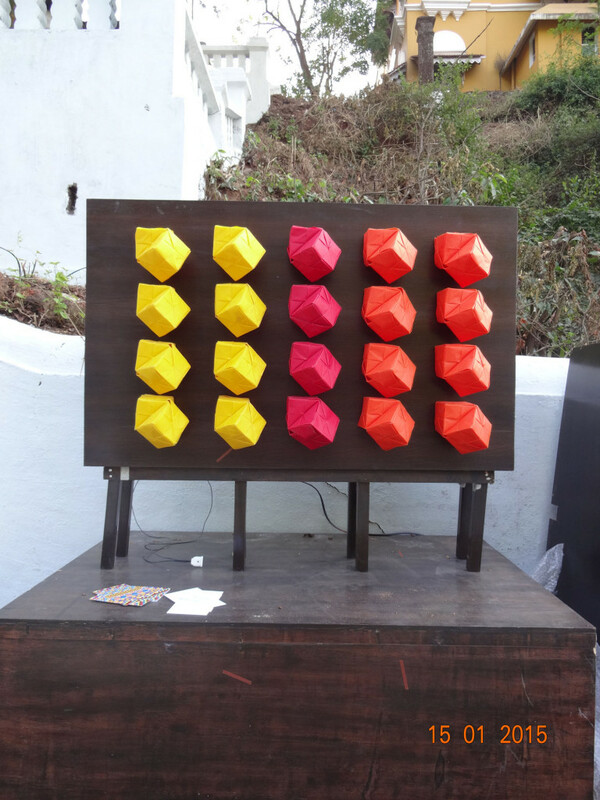 Forms using 12, 30 and 120 Turtle units were used incrementing towards a perfect sphere. 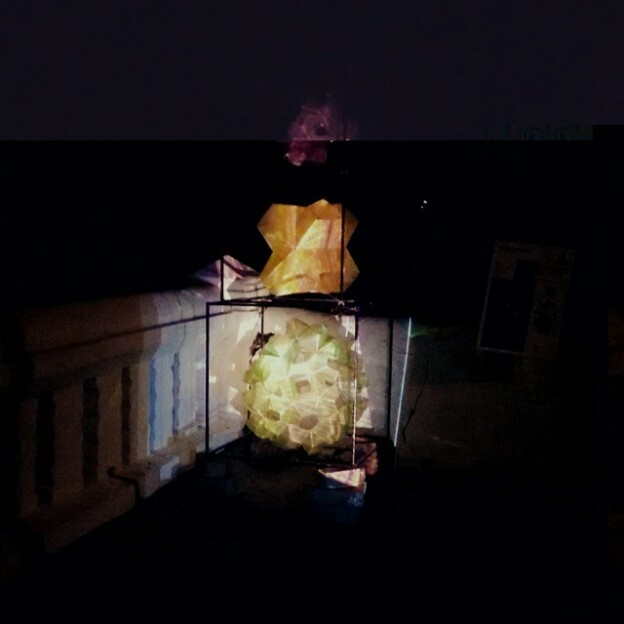 Projection mapping of spherical sacred geometry diagrams were projected on the generated surfaces.